VW is steaming forward with a plan to be the world's largest automaker by 2018. BERLIN (Bloomberg) -- Volkswagen AG, Europe's largest carmaker, has the full backing of Lower Saxony to pursue an expansion strategy, including its merger with Porsche AG, according to the new head of the German state with veto power at the automaker. “We support Martin Winterkorn's ambitious goal to make VW No. 1 in the auto market worldwide by 2018,” designated Prime Minister David McAllister said in an interview in Hanover, Germany, the first since he was named successor to Christian Wulff. McAllister, 39, said he stands “rock solid” behind Lower Saxony's 20 percent stake in the automaker. Volkswagen paid $2.5 billion for a stake in Suzuki Motor Corp. in January to expand in India and is taking over Porsche Automobil Holding SE's sports-car making operations, adding a 10th brand to VW's marques that include Skoda, Seat and luxury brands Audi, Lamborghini and Bentley. Volkswagen is also building a factory in Tennessee to boost U.S. sales and plans to add a 10th plant in China to double production capacity in the world's biggest auto market. Wolfsburg-based Volkswagen is acquiring Porsche after Wendelin Wiedeking, former CEO of the 911 sports-car maker, failed to use options transactions to take over VW. Resistance from Wulff last year helped prevent Porsche from achieving its plan to buy 75 percent of VW, a holding that could have given it access to VW's cash. 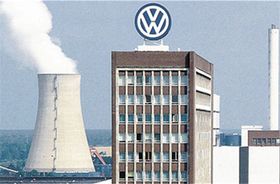 Under Germany's so-called Volkswagen law, Lower Saxony may block major decisions by the carmaker. Porsche's holding company owns 50.7 percent of VW's ordinary shares. Qatar Holding LLC, part of the country's sovereign wealth fund, is the third-largest owner with a 17 percent stake. “Lower Saxony is a firm pillar in that structure,” said Stefan Bratzel, director of the Center of Automotive at the University of Applied Sciences in Bergisch-Gladbach, Germany. Volkswagen's preferred shares, which are more widely traded than the common stock, rose 1.36 euros, or 1.8 percent, to 76.43 euros at 10:12 CET in Frankfurt, extending this year's gains to 17 percent. Porsche gained 2.8 percent to 37.03 euros. Wulff's opposition to efforts by the European Union and by Wiedeking to scuttle the VW law is the “biggest success” of his seven-year tenure, said McAllister in the June 24 interview. Wulff, who will be elected German President June 30, forged an alliance with Bernd Osterloh, Volkswagen's top labor leader, to defend Lower Saxony's ability to veto strategy decisions at the carmaker. That helped him win the support of Ferdinand Piech, VW's chairman and a member of the clan that controls Porsche. McAllister, son of a Scottish soldier and his German wife, grew up in Berlin and has been a member of Chancellor Angela Merkel's Christian Democrats since 1988. A lawyer by training, McAllister will become Germany's youngest state prime minister. Lower Saxony's ruling coalition of Christian Democrats and Free Democrats control 81 of the state parliament's 152 seats, enough to guarantee McAllister's election.